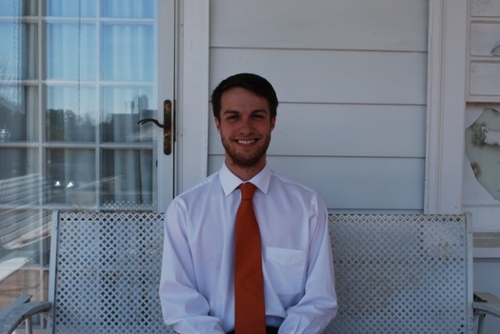 Will Gibson, senior in industrial and systems engineering, and Camp War Eagle head counselor, has overcome tragedy to become one of Auburn’s most dedicated and involved students. Having lost his mother to a summer boating accident at a young age, and his father taking his own life just a few years later, Will has turned devastating personal events into a comeback story that is just beginning. A native of Old Hickory, Tennessee, Will grew up watching Auburn football from a young age. His dedication to the Tigers was so strong that from 2008-11, Will and a family member would make the 12-hour trek every Saturday to and from Auburn to attend each home football game. 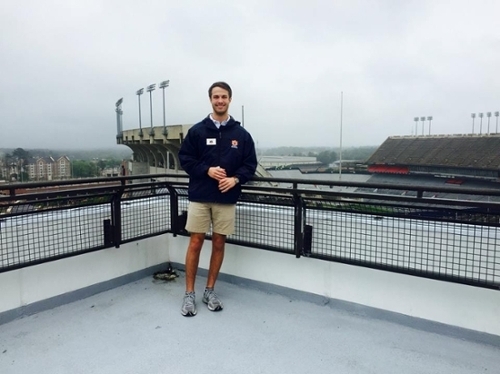 From his role as a fan to now a student, Will has fully embraced the Auburn family through serving as a director of Freshman Forum; selected as co-director of Auburn SGA’s BIG Event 365; representing Auburn on campus tours to potential students and parents as a student recruiter; and becoming a Camp War Eagle head counselor. Why did you attend Auburn? My older brother graduated from Auburn in 2003, and I had become a fan of Auburn football and would watch each game every Saturday. Actually, looking back on the circumstances that took my parents lives, Auburn football was one of the greatest distractions for me. We had a great season in 2010, and my personal life was difficult to handle at that time. So that year in particular was a blessing for me, and gave me something to be excited about and look forward to each week. Football initially drew me to Auburn, but once I visited the campus I fell in love with the university and knew that’s where I belonged. The Auburn family has always been there for me, through tragedies and triumph. Without the many, many people who have supported me before I came to Auburn and since I’ve been here, I know I would not be where I am today or have near the success. My brother graduated in electrical engineering, and at first I thought I wanted to follow in his footsteps, especially since my father owned an electrical engineering company and I wanted to make him proud. However, during an engineering orientation class, I spoke with one of the advisers about my passion for making things work more efficiently and productively. Together, we decided industrial and systems engineering would be a better fit for me. The management side of engineering really appeals to me, and I want to study and learn that part of the business. In the future, I want to be the person working between the company CEOs and the engineers to bring ideas together. How do you balance all of your extracurricular activities with the rigorous engineering curriculum? It’s not easy, I will say that, and I’ve learned to get by on just four to five hours of sleep at a time. I’ve also had to improve in balancing my time and creating schedules for myself. This past spring, I took five industrial and systems engineering classes, put in my hours required as a student recruiter, planned the BIG Event 365, and also made a commitment to work on the Miss Auburn campaign for Lauren Jones. During this hectic time, I sat down with a friend and created an hour-by-hour schedule from 7:30 a.m.-2:30 a.m. of how I could attend all of my classes, complete my homework, study for tests, stay involved in my campus activities, and in between, campaign for Lauren. I followed that schedule as closely as I could and with the help of those around me, I was able to pull it all off. The best part is Lauren ended up winning Miss Auburn, which meant so much because her platform [striving to give students with disabilities the same educational opportunities as those without] hit close to home for me. I was so thankful to be a small part of the team that put a lot of work into her campaign and see it pay off. What has your experience been like as a head Camp War Eagle counselor? Going from a camp counselor to a head counselor is quite a change. Last year, I just worked with incoming students to help them understand what classes they should take, campus life, how to get around campus, and answer any questions or address any concerns they had. At its core, it was just the students and I working together. This year, as a head counselor I have a much different role. I help lead large group break-out sessions with both students and parents; I help ensure all of the Camp War Eagle groups get from Point A to Point B without any logistical challenges, and if there are problems, I help in solving them. For example, during the first Camp War Eagle session in May, there was a sudden downpour while we were all in the old Foy complex, and all of the groups had to remain in the building for six hours. Talk about a logistical challenge. I was running around with other camp counselors figuring out how to keep everyone calm, engaged and not restless. But I signed up for this and I wouldn’t trade it for anything. One of the best parts of my job as a head counselor is seeing the other counselors come in to the process a little apprehensive, but through training, I see them transition into confident counselors full of excitement that they want to share with incoming students. What advice would you offer to incoming students attending Camp War Eagle? I tell students to just have the desire and determination to succeed. Not a lot of students have the opportunity to come to a school like Auburn, so take advantage of the time you have here. I would also warn students that classes are going to get tough, and you have to remember to keep your head up and believe in yourself, and surround yourself with those who also believe in you. After graduation I’m looking at two options. I either want to go continue my education by pursuing an MBA through Duke University or the University of North Carolina at Chapel Hill; or I may immediately go to work for an engineering company, get a few years of experience under my belt and then go back for an MBA. Regardless of the outcome, I’m excited to see where my future leads me. How has Auburn made a lasting impact on you? Auburn has given more to me in the four years I have been here than I can ever give back to it. I’ll come back to Auburn for the rest of my life because it is so much a part of me. Both of my parents are gone, but now I have an incredible support system that helps me strive each and every day to be my best, and has largely shaped me into the person I am today.